It's evident where the hearts of people lie when driving down the street, past the neighborhood homes with basketball goals stationed at the edge of practically every driveway. We happen to have great basketball programs surrounding the area where I live: The University of Louisville, Indiana University, University of Cincinnati, Xavier University, The Ohio State University and recently the not-so-Cinderella, Butler University. Not too much further, we have states like Michigan and, of course, North Carolina, that boast their own assortment of powerhouse programs. All of these teams mentioned are perennial participants in the NCAA Tournament. My sisters and I had the honor and privilege to be brought up in the truth, the truth being that Kentucky Basketball is the best college program on God's green earth. My dad loves them, my grandfather loves them, so naturally, we love them as well. One of my first crushes I can remember was a college kid by the name of Rex Chapman. He was a Kentucky boy, too: it was love at first sight and I was only seven years old. I also recall, my dad would turn down the television announcers and turn up the radio to hear the legendary voice of the Wildcats, Cawood Ledford. At halftime, we would throw on our coats and shoot hoops on those lovely cold wintry days. There was a time in the late eighties I refer to as the "Dark Ages of Kentucky Basketball", when it seemed that God had forsaken our great state and left us shamed in scandal: two years probation and the ejection of Eddie Sutton along with his whole shady program. My father took me to a game at Rupp Arena during that period and I remember his telling me about our troubles. The mood at the arena that day was one of frustration – I have a vision of a player drop-kicking the basketball into the stands after a bad call. Pretty terrible. But we, as fans, never jumped ship. 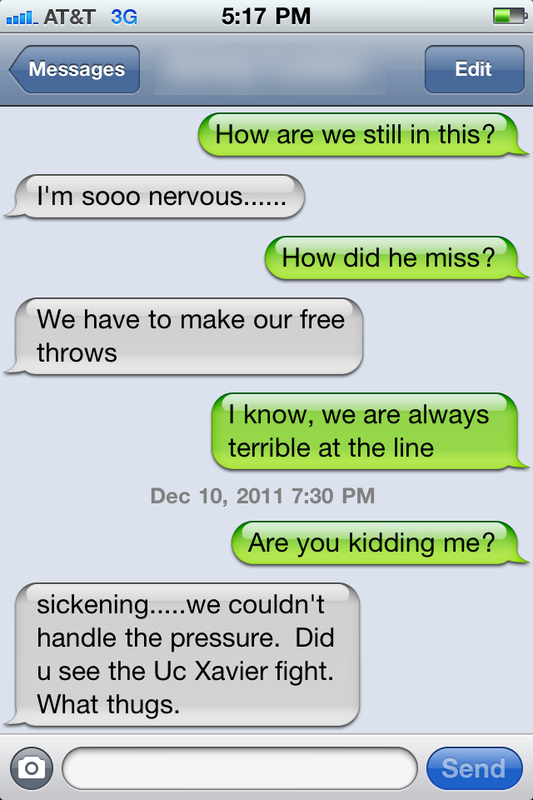 We kept calm (well, as calm as a Kentucky fan can be in this situation) and waited for a redeemer. 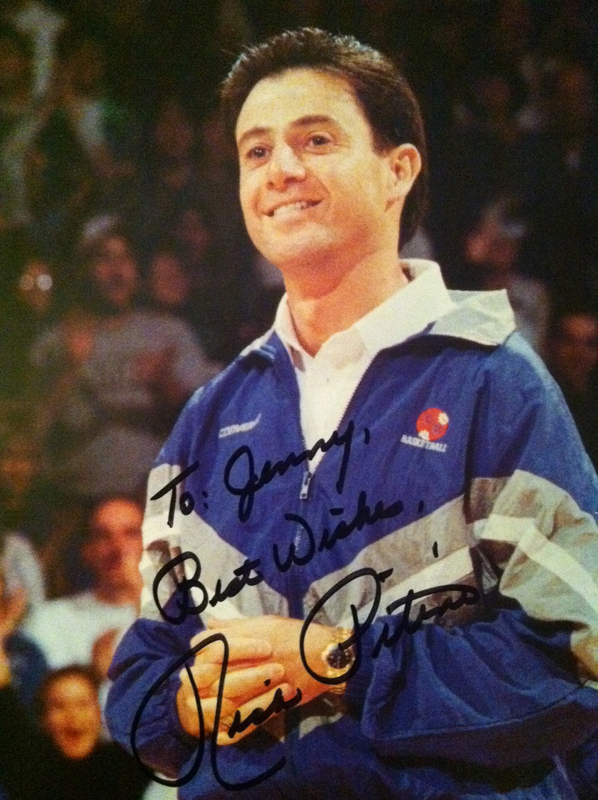 Little did we know that redeemer would be a slick Sicilian-American, speaking with a thick New York accent, by the name of Rick Pitino – and we worshiped him instantly. His style of basketball was exactly what we were praying for– fast paced and aggressive, plus, he introduced us to something heavenly: full-court pressure defense, devastating to any opponent. He was once quoted as saying Kentucky is the "Roman Empire of College Basketball" and he certainly was Caesar. As for me, I grew up in Northern Kentucky and attended a small, private Christian school from Kindergarten to 12th grade. What was unique about my school is that kids from all over the area would commute to class everyday. This included boys and girls from not only Kentucky, but also as far as Ohio and Indiana. It was like three rivalries colliding and I was caught in the crossfire. A literal melting pot of some of the best NCAA programs directly in their heyday, about to boil over at any time. We had the kids who embraced Bobby Knight and his chair-throwing temper tantrums, and then we had the kids who thought Bob Huggins' brash behavior and Cincinnati basketball were far more prestigious than my beloved Wildcats. I know in my mind they were absolutely wrong and had no understanding about the tradition of Kentucky. They could never understand and if they did, they would be compelled to swear allegiance to Kentucky on the spot. I hated each of these programs equally and with great fervor. 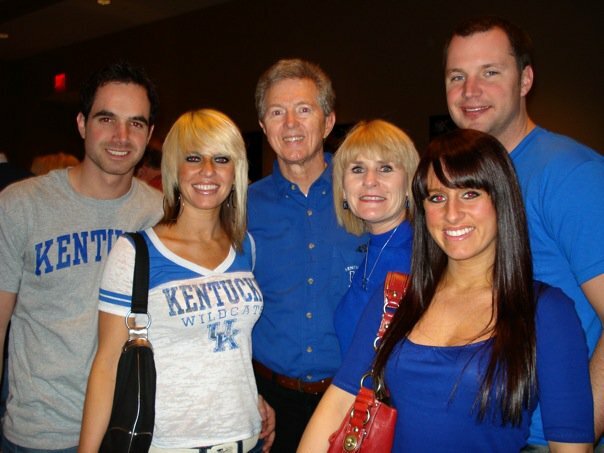 You can be sure that whenever Kentucky lost, I would get an earful the next day from the Hoosier and Bearcat cronies who loved to hate the Royal Blue. I would get a stomach ache heading to school, thinking about the teasing that would most definitely ensue. A day that will live in infamy for all of Big Blue nation was the night of March 28th, 1992. A little bit of background is needed. Kentucky had managed to make it all the way to the Elite Eight of the NCAA tournament despite the fact that they had been on probation and therefore absent from the tournament for the two years prior. What made this team so special to Kentucky fans is that three of the four Senior leaders were all from small towns in Eastern Kentucky. To make this evening in March even more dramatic, Kentucky faced a Goliath of an opponent: Duke University with its star players anyone would love to hate– Christian Laettner and Bobby Hurley. 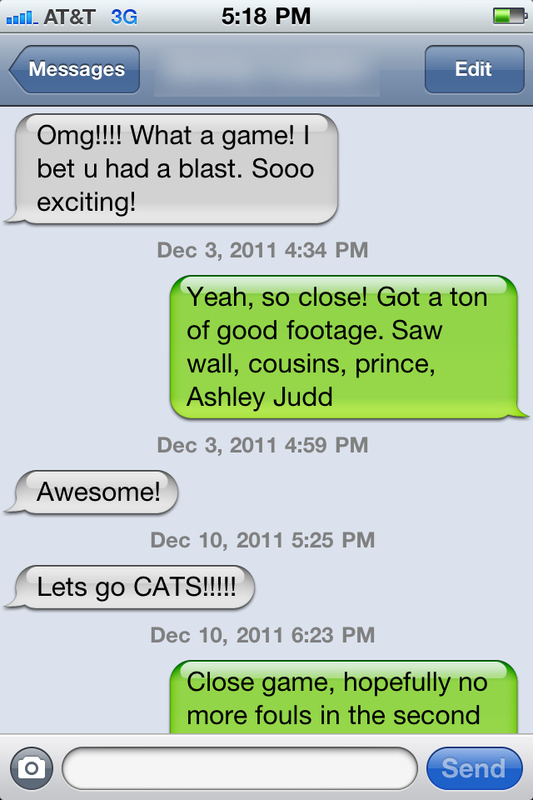 No one outside of the Bluegrass believed the Cats could hang with Duke, who were the reigning National Champions. My parents, as they usually do, invited all of our friends to watch the big match-up at our home. We all crowded around the television as we witnessed the game unfolding. Tensions were high as both teams ran up the score but stayed neck-and-neck throughout regulation. In a particularly heated play of the game, Kentucky's Aminu Timberlake ended up on his back after a hard foul. Once the referee blew the whistle, Christian Laettner peered down at the fallen player and proceeded to stomp on his chest. I have never been an angrier television viewer than I had been at that moment. The Bluegrass state yelled out a collective snarl of protest. Although Laettner did receive a technical foul, we believed he should have been ejected for his behavior. See the Stomp here. However mad we were, it wasn't unexpected for the pompous Laettner to behave in that manner. 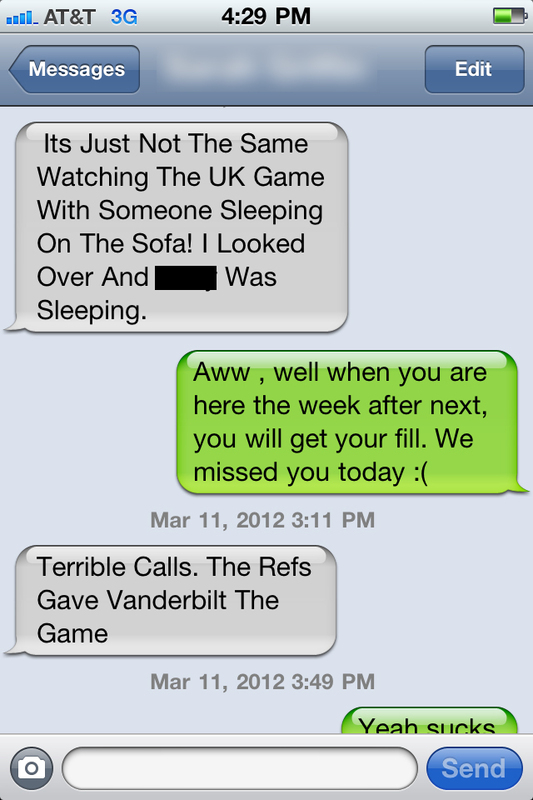 Kentucky's hatred towards him festered even more as the clock wound down. Somehow Kentucky managed to take the game into overtime, and each team had broken the century mark. With only seven seconds left, Kentucky's Sean Woods was able to throw up a wild layup that somehow found its way into the basket, placing us ahead of Duke by one point. Could we actually win? It was, in-fact, possible. Timeout was called with only seconds left on the clock. Pitino's questionable call to place two guards on Laettner (who was having a perfect game with 100% shooting, seriously) and not place any man on the inbounder, who happened to be none other than future NBA star Grant Hill, would prove faulty. We all held our breath as Hill threw the ball like a quarterback, arcing high into the air cross-court. Time seemed to slow as Laettner connected with the pass, took a few dribbles, turned, and shot the ball over Pelphrey and Feldhaus as the buzzer sounded. Watching the basketball not even touching the rim and swishing into the basket felt like a Muhammad Ali sucker-punch straight to my gut. I crumbled to the floor, my knees unable to hold me up. The only words I could manage to squeeze out were, "Call the refs," between my heaving sobs. "Call the refs and tell them to change the game!" I was in hysterics, barely able to catch my breath, causing me to hyperventilate. Besides losing an absolutely heartbreaking game, and to pour salt on my very fresh wounds, Cincinnati won its game that day and was heading to the Final Four with their stars Nick Van Exel and Corey Blount. Going to school the next day to face all of the Kentucky haters was going to be my personal hell-on-earth. Unable to control myself, my mother intervened and forced me to take a hot bath, hoping to calm my tortured soul. I went to bed contemplating ways to call in sick or somehow switch schools so I could avoid the taunting from UC fans at school. Although I did somehow survive school the next day, that loss still hurts when I watch that replay, even to this day. It doesn't help that it is arguably called the Game of the Century, and commentators absolutely love to bring it up. Heck, even Chris Farley did a parody of it for ESPN, posing as an overweight Christian Laettner, scoring the final shot. And now with the 20th Anniversary of that game looming, the hurt and hate still feels as strong as the day it happened. Although it wasn't Kentucky's time to win that National Championship in 1992, it brought us back into the NCAA spotlight once more. Pitino himself labeled the little-known seniors as the Unforgettables, and there was never a more fitting name. Throughout the nineties, I managed to witness some of the best college teams that have ever played the game. After seeing Jamal Mashburn, and my favorite point guard, Travis Ford, have some great years at Kentucky, we managed to win the 1996 National Championship with one of the most impressive starting fives to ever play the game. I think I played "We are the Champions" over and over again for the next year as tears of joy stung my eyeballs. Victory was so sweet! Then for icing on the cake, we won a surprising seventh National Championship in 1998 with the new head coach Tubby Smith. Despite our disdain for all things Duke, I guarantee you will never meet a woman that knows the game of basketball better than a Kentucky girl, young or old. She could probably teach you a thing or two about the sport. Along with my sisters, my closest girlfriends are just as die-hard as we are. I think our greatest disappointment in life (said jokingly of course to all the men in our lives) has been finding a husband that isn't a true fan and having to deal with the fact that they aren't as interested as we are. 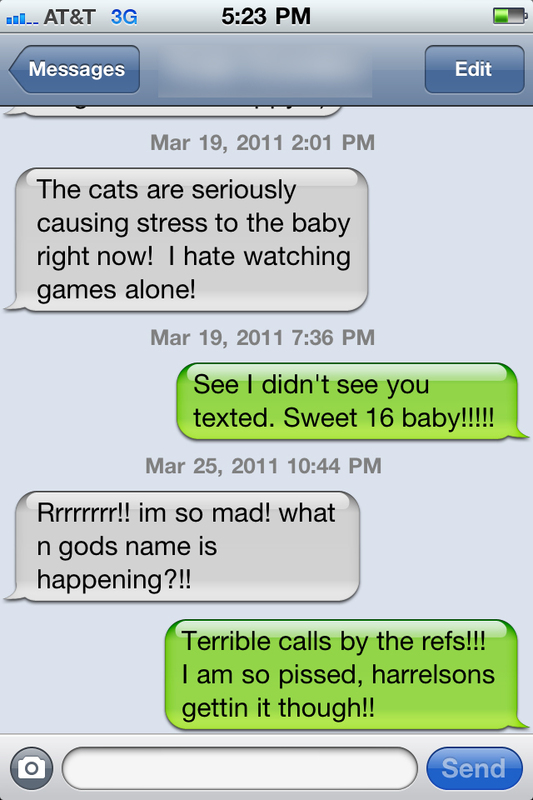 We end up resorting to texting each other during the game to rant about our frustrations over the refs' biased calls against the Wildcats. 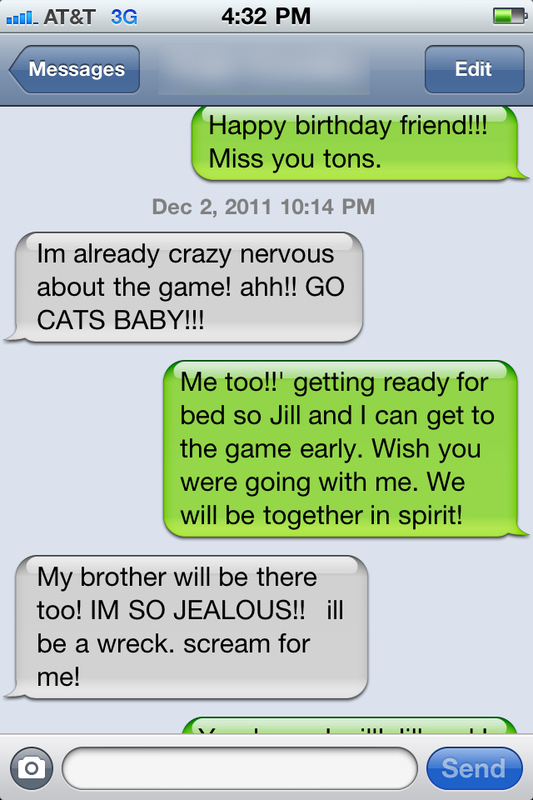 See some typical texting conversations below..
As I get ready for yet another year of March Madness and the amazing highs and incredible lows it can bring me, I have to be thankful for all the years spent as a Kentucky fan. We may be annoying (which I think any die-hard fan can be...) but the problem for outsiders is that there are SO many die-hard fans of every age and gender; they're everywhere. Have you seen the numbers in which Kentucky fans travel to away games? Cities salivate at the chance of hosting a game in which Kentucky plays, as you're sure to see business boom as Cats fans take over the town. I find that some of the best memories spent with family and friends are gatherings at my parents' house for games, trying to set up "stadium style" seating so we can pack everyone in. 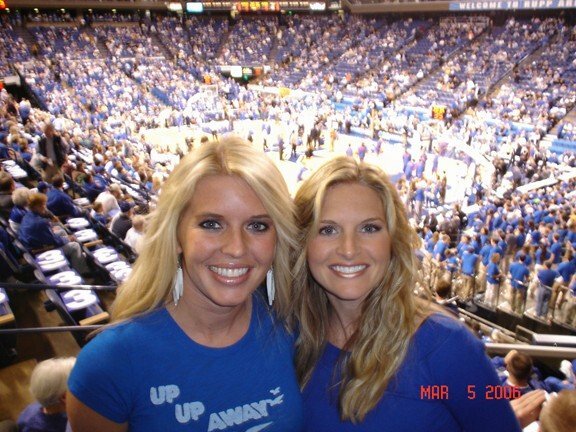 Passing out the pom-pons, placing "3" signs on the mantel and playing the UK fight songs on the iPod during timeouts. It's all part of our nerdy experience as fans. 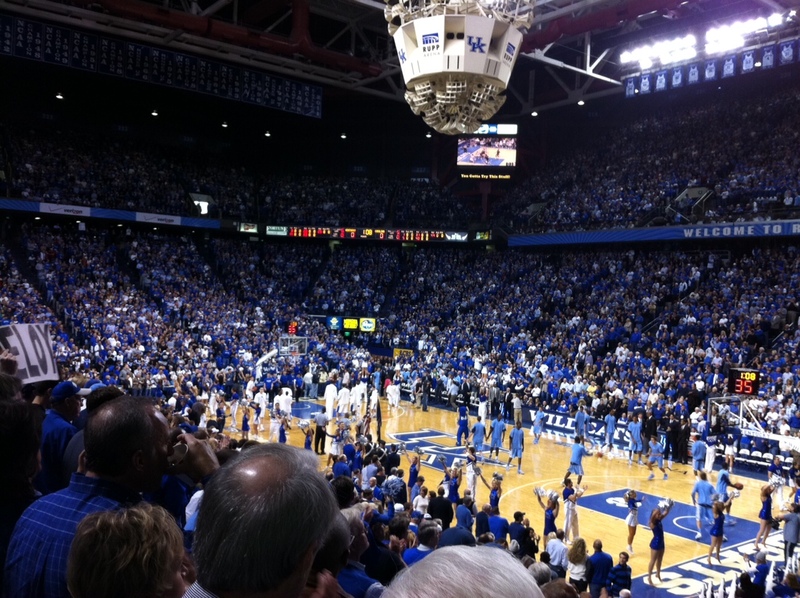 Ever been to a game at Rupp Arena? If you haven't, it's probably because you couldn't get a ticket at the sold-out venue, where they pack 25,000 fans in like sardines all the way up to the rafters. Everyone there is focused on the actual game, not the social scene that comes with going to events. All eyes are glued on the court for every home game. And that's not just when we're number one; it's every season at Kentucky – no matter what our record might be. Viewed 8708 times so far.